Time for some overclocking of the GeForce GTX 1070 Founders Edition and running the tests again to see what hashrate increase can we expect from the GPU with the increased operating frequencies. The Founders Edition cards are somewhat limited in the max power you can get, but the good news is that the GTX 1070 FE still has the same 8-pin PCI-E power like the 1080, even though its default TDP limit has been lowered to 151W and the Power Limiter allows for just 12% increase over the default TDP (169W max TDP). There is already a tool for flashing modified video BIOS files available, so now the only thing we need figured out is how to modify the TDP limits in BIOS and other settings such as frequencies and voltages in order to be able to squeeze some additional extra performance over the stock clock capabilities of the Founders Edition cards and even more from the non-reference designs that are already starting to become available on the market. We already know that the GTX 1080 and GTX 1070 GPUs are handling quite well overclocking and you can squeeze quite a bit extra performance from them if you are not limited and don’t care than much about the power usage. We are trying the GTX 1070 Founders Edition to see what it can do withing its current limits without touching the core voltage and what we got was: Power Limit + 12%, Core Clock + 210 MHs, Memory Clock + 830 MHs, the max settings that are running stable for 24/7 mining on our test card and the results are below. Do note that these can vary from card to card, so you should experiment until you find what works best for you. Regardless it seems that the GTX 1070 FE cards are doing quite well in terms of overclocking in general, so you should expect an nice extra performance boost from them and even more from the non-reference designs. The performance increase we get after overclocking the Nvidia GeForce GTX 1070 Founders Edition card with the clock settings above are pretty much consistent with what the GTX 1080 FE shows. The performance boost in terms of hashrate increase in the various algorithms is about 12-14% higher than at the stock settings and better results could be achieved with increase of the voltages, however with that you will also need to be careful that you are fitting in the TDP limit. It is interesting to note that the GTX 1070 FE does perform better on NeoScrypt (668 KHS stock/771 KHS overclocked) than the 1080 FE, but it it still outperformed by the GTX 980 Ti for example. It seems that the slower GDDR5 video memory used here does perform better with the memory intensive algorithms unlike the faster GDDR5X memory used in the 1080, however the GTX 1070 still needs some fixes for NeoScrypt. As already noted the situation with Pascal GPUs including the GTX 1080 and the GTX 1070 is the same for Ethereum mining under Windows resulting in very low hashrates, so while waiting for a driver fix you might want to go for Linux for Ethereum mining on these cards. All other algorithms we have tested besides the not so great NeoScrypt performance are doing well under Windows 7 and 10, so mining for these you don’t need to rely on Linux, especially if you are no good with it. 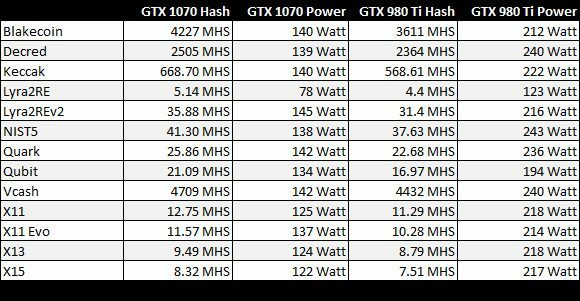 Time for a quick look at the power usage of the GeForce GTX 1070, the reference design from Nvidia that has a TDP of 151W set by the manufacturer, making it pretty energy efficient for the performance it provides for crypto currency mining. We are checking the situation with the different algorithms apart from Ethereum, because we already know that the GTX 1070/1080 is far from great choice for Ethereum mining when using Windows and we are testing the mining for other algorithms with Windows 7. Looking at the results from the different algorithms the Nvidia GeForce GTX 1070 Founders Edition does seem to be about 30% on average slower (25%-33%) compared to its bigger brother – the Nvidia GeForce GTX 1080 Founders Edition at the stock settings. The situation with the power usage difference between the two cards is also very similar to the performance difference in the tested algorithms. So the next very interesting question is how well the GTX 1070 will overclock and how will the OCed performance compare to a stock GTX 1080 and an overclocked one. We are going to be posting our results from the GTX 1070 overclock soon, so stay tuned for them. 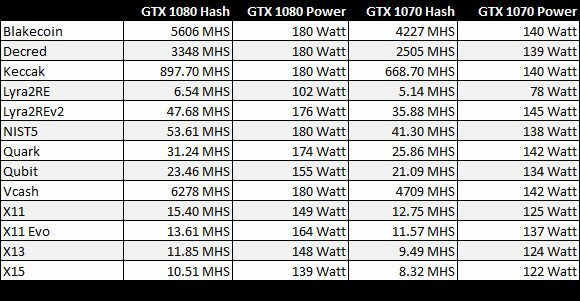 While we were testing and comparing crypto mining performance we have actually noted that the comparison between GTX 1070 and GTX 980 Ti is actually more interesting as you can see from the table with results. As you can clearly see the GTX 1070 is slightly faster than GTX 980 Ti, but power usage wise it is much more efficient. This can give you a better idea on the evolution of performance and power usage between the previous and this generation of Nvidia GPUs. The GTX 1070 is also a more attractive choice for building multi-GPU mining rigs at the moment as compared to the GTX 1080, though you might want to wait a bit more for the non-reference designs to come out that will allow more serious overclocking and thus even better performance. Recently we have tested the new Nvidia Pascal-based GeForce GTX 1080 Founders Edition GPU for crypto mining and it is now the time to see what the little brother in the form of GTX 1070 is also capable of. 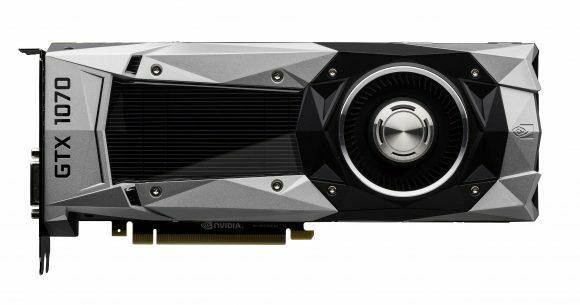 The Nvidia GeForce GTX 1070 Founders Edition is a little stripped down version of the current top model in the form of GTX 1080, but generally the two are not that different. The GPU on the GTX 1070 is a bit less powerful and the memory is regular GDDR5 instead of the GDDR5X used in the 1080. The cooling solution, the backplate, even the 8-pin power connector are the same on both and that should signal a good overclocking potential for the GTX 1070 and the significantly better price makes it the more interesting of the two for crypto mining. 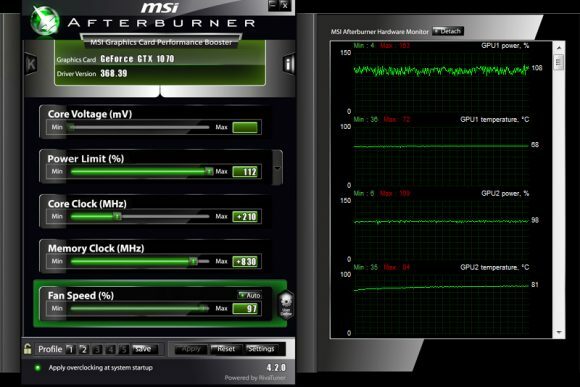 Do note that the TDP rating of the GTX 1070 is just 151W and the power limiter allows you for just 12% increase over the stock limit, so you get 169 Watts max without having to resort to something like BIOS modification for example in order to be able to get serious in terms of overclocking. We are going to cover the overclock for the GeForce GTX 1070 and the mining hashrate with OC in a follow up article, for now we are comparing only the performance at stock settings. We have already discussed the not so good situation with Ethereum mining on the GTX 1080 and unfortunately things are the same with the GTX 1070. Mining Ethereum under Windows is pointless at this point as the hashrate is very low (issue with the video driver) and although this might be fixed at a later time with a driver update, for the moment the only option you have is Linux. The results under Linux are not great though the GTX 1070 apparently does perform better because of the GDDR5 memory even at lower frequencies as compared to the GDDR5X, especially when you overclock the GTX 1070. We are going to be doing some more testing for this under Linux at a later time in order to see what the new Nvidia Pascal-based GPUs are really capable of for mining crypto currencies based on the Dagger-Hashimoto algorithm like Ethereum, but for now we are focusing on the other algorithms. The results we’ve got for other popular algorithms besides Ethereum’s Ethash are pretty interesting as you can see from our summary in the table. It is interesting to note that the GTX 1070 is a bit faster in all algorithms besides Decred than the GTX 980 Ti and it does it with a significantly lower power usage. Price wise the GTX 1070 is still a bit more expensive than GTX 980 Ti, but the power savings on the long term should more than justify the difference. With that said we should note that the GTX 980 Ti has never been one of the popular Nvidia video cards among miners due to the pretty high price that it has been keeping. 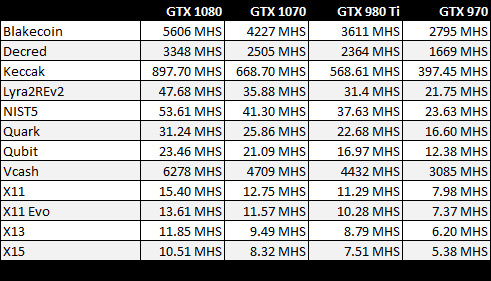 Compare to GTX 970 the new GTX 1070 is significantly faster, and the results of the 1070 were not that close to the ones from GTX 1080 as we’ve hoped they could be. 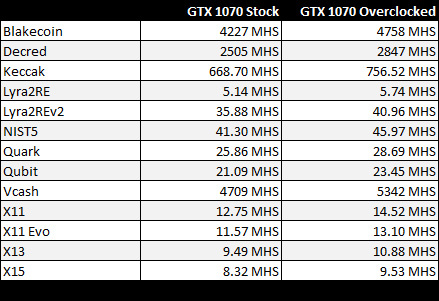 With some overclocking however we expect that the gap in performance between a stock GTX 1080 and the OCed GTX 1070 cloud become pretty insignificant, but that would need some more testing to confirm. Do note that we have not included results from Lyra2RE and NeoScrypt this time, because with both algorithms the GTX 1080 and GTX 1070 did not perform well and would need some optimizations. In fact there is already an optimized version of ccMiner that fixes the performance issues with Lyra2RE that also brings quite big performance boost for older GPUs as well – ccMiner 1.7.6-r6 fork With Faster Lyra2RE, but for Neoscrypt the performance of the Pascal GPUs needs some work.